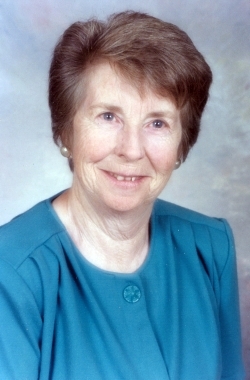 HARTWICK - Fae Arlene Chapman (Murray), beloved wife of John C. Chapman, mother, grandmother, and great grandmother, passed away March 16, 2016, at Bassett Medical Center in Cooperstown. Born January 7, 1933, in Jamestown, Fae was the elder daughter of Harry J. and Glenna H. Murray. Fae received her bachelor's degree in education from SUNY Geneseo and spent over 20 years teaching kindergarten and sixth grade at Cooperstown Central School before retiring. A resident of Hartwick, New York and Englewood, Florida, her talents and interests were many. She was an avid reader, gardener, pie maker extraordinaire, accomplished pianist and home builder. Fae loved all things in nature; birds and flowers were her special delight and she enjoyed capturing the beauty around her through photography. She was especially keen on recording the beauty she saw in cloud formations. Loved by so many, Fae will be remembered for her undying devotion to family, sense of humor, determination, and boundless energy. Her quick wit, calming presence, and words of wisdom were a joy to all. Fae's soft and gentle demeanor had a way of brightening even the darkest day. She was an elegant little lady with a spirit that was larger than life. Fae is survived by her husband and best friend of 63 years, John C. Chapman III; sister, Sandra D. Murray of Pittsford; daughter Kathleen DesJardins (Bill) of South Burlington, Vermont; daughter Linda Levandowski of Cooperstown; daughter Patricia Blau (Thomas) of Cary, North Carolina; son John C. Chapman IV (Sheri) of Port Charlotte, Florida; uncle Eddie Fox (Mary) of Ohio; aunt Elora Murray; 11 grandchildren: Scott DesJardins (Katie), Ellen O'Neil (Tristan), Leanna Levandowski (Matt), Sean Levandowski, Thomas Blau IV (Samantha), Erin Blau (Clayton), Kristen Blau, Ryan Blau, John Chapman V (Savanna), Brett Dudgey and Brendan Chapman; six great grandchildren: Russell DesJardins, Audrey DesJardins, Remi O'Neil, Ella Blau, Claudia Blau, and Landon Chapman; and several cousins. Fae was preceded in death by a daughter, Michele Anne; her parents, Harry and Glenna Murray of Englewood, Florida; and a precious granddaughter Julia A. Levandowski of Cooperstown. Fae's final resting place will be in the Hartwick Cemetery.